Is that a marker that others can see like in Rainbow 6 Siege? We use that all the time, even when we are using voice chat. Yep, it's context sensitive too so you can ping ammo or weapons etc. Holding the button down brings up a wheel of options so you can quickly select what you want the ping to indicate if you're trying to highlight something specific, like pinging an area to defend or a direction you hear gunshots. It's very useful. Double ping signals an enemy and pinging ammo/weapons puts a marker of that item on the map for your squad to see. Each person can mark two items before they start to replace each other. It's a really good system . 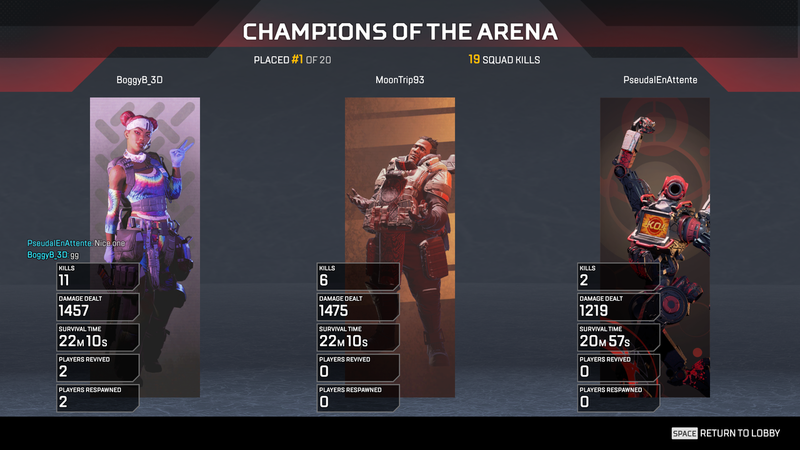 First Apex victory. Pretty pleased with it. Got mine on Thursday with lifeline. I feel I’ve completed it and I can go back to Rainbow now, same as I did with Fortnite. I never see the longevity of these games, too much is based on random chance. I've seen you in game a few times but haven't jumped on yet asit's really hard to catch someone outside a match then I can't be bothered to wait. I have to admit I don't really 'get' this game. After hours of PUBG, the shooting feels like trash in this, and everyone is a bullet sponge. It also still has that fortnitey f2p aesthetic that puts me off. Meh. Shooting is anything but trash, it's pretty similar to Titanfall 2 which has great shooting. People are bullet sponges to a degree but the game is going for a slightly longer time to kill and I think that's OK. Not every BR has to have you melt under fire. I do agree with the trash shooting. 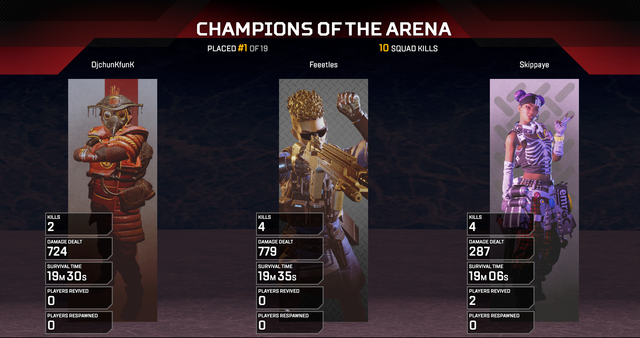 The only respawn gun I ever liked was the auto locking pistol -_- Blackout has the gunfeel but I think Apex is a better game. I thought it was too bullet spongey at first but it just reinforces the need to fight as a squad. Also the lever action shotgun makes things a fair bit simpler. I wasn't sold on the style at first, but I'm quite enjoying it now and it's a refreshingly different game to PUBG. Finally installed this tonight (I had to uninstall PUBG to make enough room! ), and it's okay? First game was absolute dogshit, as it Battle Royale tradition, I landed in some random location, failed to find a gun, and met a dude with a shotgun. The end. I waited for a couple mates to be online and had a much more fun experience. Having someone explain WTF is going on really helps a lot. The ping system is fantastic, and a lot of the game's mechanics seem inspired by frustrations of other games. It's a really nice little evolution. The pick-up system is really nice, offering to attach things to guns that aren't currently equipped, it tells you in plain English "you have better armour" or "you have this equipped" when looking at stuff... really well thought out. I'll come back a few more times, but I have no clue what any characters abilities are apart from the one they let you do the training mission as. Gotta watch some explanations on YouTube I guess.